Synonyms: Eupatorium adenophorum, E. glandulosum, E. pasadense. Ageratina adenophora (croftonweed, eupatorium) is a perennial herb or small shrub (family Asteraceae) found along the coast of California and in the South Coast and Transverse Ranges. It prefers disturbed areas, coastal canyons, riparian areas and scrub, and is especially invasive in mild coastal areas. Originally introduced to California as an ornamental plant, croftonweed escaped cultivation by producing abundant seed that is dispersed via wind, water, soil movement, and by clinging to animals and people. 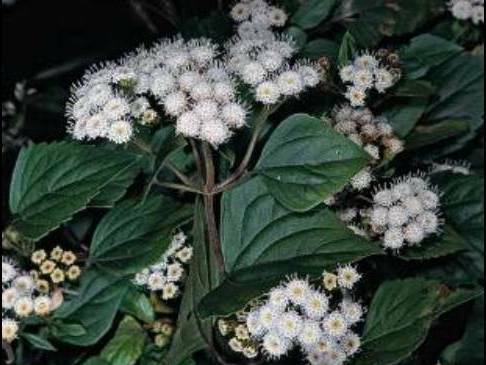 This invasive plant is considered noxious in parts of Asia, Australia, New Zealand and Hawaii.